A preference setting affects how Photos handles your images. Occasionally when I receive a photo from someone via email and want to keep it, I have downloaded the image file to the desktop and then imported it into Photos. However, after I delete the photo from the desktop, Photos then reports that the original cannot be found. Why is Photos not importing the original into its database as it does photos from my iPhone? If this box is unchecked, images are referenced by not copied. The most likely case is that at some point you (or someone else who might be using the same machine?) changed a preference. 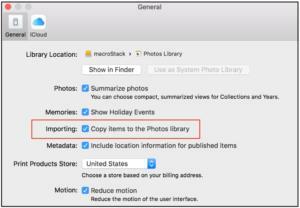 In Photos > Preferences, if the Copy Items to the Photos Library box isn’t checked, then images are referenced rather than copied. 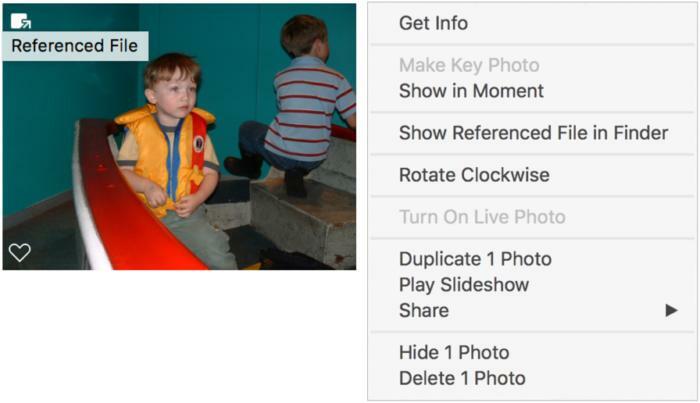 A referenced image is a pointer within Photos to the orignal image in its original location. If you modify the image, Photos does create a duplicate within its current library. Check the box to resume copying images into the Photos library. Its thumbnail has a Referenced File icon, which is a square with an arrow coming out of the corner in the upper-left of the thumbnail. Right-clicking the image offers Show Referenced Image in Finder. 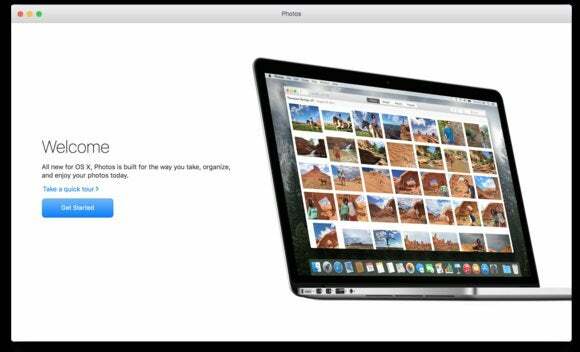 With the image or movie selected, the File menu displays Show Referenced Image in Finder. Referenced files are marked in a few different ways. You can also create a smart album that contains all referenced images; here’s a column that explains how near the end. If you want all referenced items or those you select to be imported into the Photos library, select one or more of them and then choose File > Consolidate.